If you were looking for a measure of human depravity, 2.7% might be a useful number. 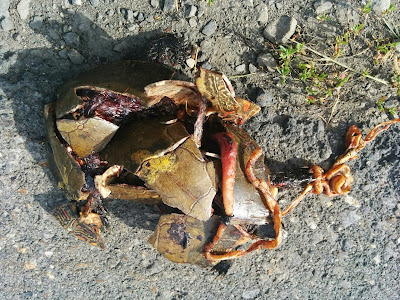 In a study of drivers at the Long Point causeway in southern Ontario, they found that just under 3% of drivers intentionally swerved their motor vehicle to run over a snake or a turtle (not real ones, but replicas used by the researchers). Welcome to the bottom of the barrel of human behaviour! "We observed 3,015 cars pass by our treatments, of which 66% (n = 2,000) met our spacing requirements. Composition of drivers was 1,592 males and 408 females. Log-linear analysis indicated a 3-way interaction (χ2 = 2376.17, df = 8, p = < 0.0001) between treatment, gender and fate. Reptile treatments were hit at higher frequencies than either the cup or control. Male drivers (n = 803) hit reptile decoys more often (n = 50) than female drivers (n = 197, 3)." I'm not a scientist, so I'm going to check in with my more data-aware collaborators to get a clearer understanding of the research (like what this means: χ2 = 2376.17, df = 8, p = < 0.0001), but for now, I'm open to any commentary you may have on the topic (hit me up in the comments). The study posits a rationale for the more-males-than-females cruelty quotient, suggesting "That more men than women intentionally hit objects on the road may be attributable to gender-typical driving behavior."